Firstly, you’ll need to find the IP address of your virtual server. On Hostinger panel, you may locate all VPS related information under the Servers section. The highlighted area under SSH Details shows your virtual server’s dedicated IP address. The following method is a pretty straightforward solution. It would involve changing your current A record in the authoritative DNS zone. This means that the A record switch must be carried out at the DNS zone where your nameservers are currently pointing. If you choose this option, your DNS zone file with all other existing entries (CNAME, MX, NS and other records) will remain with the current provider. The approach may be easier for beginners or those who do not wish to alter the location of their DNS zone. Now that you know where your domain is pointed, navigate to the provider and open up your domain’s DNS zone. 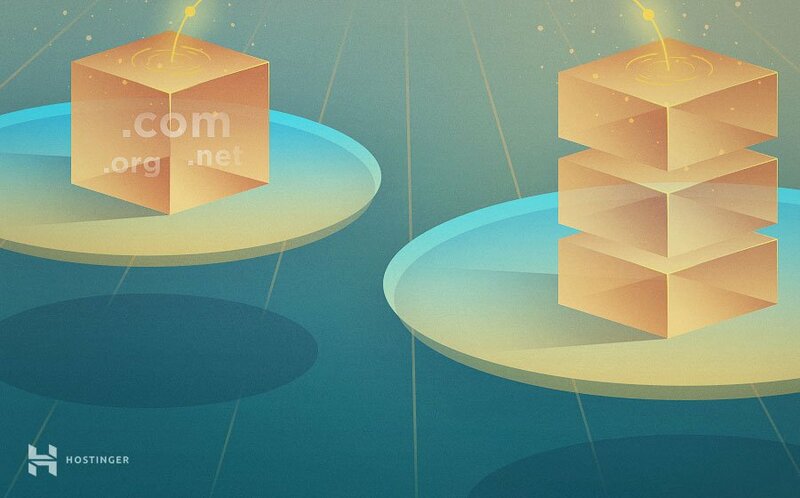 Using two A records – one for the www subdomain and another for the domain itself. Using A record for the domain and CNAME for the www subdomain. Both of these options will provide you with the same result. Start by finding the current A record value and replace it with the dedicated IP address located earlier. Below, you’ll find a demonstration of how the entries should look like in your DNS zone. If the output shows your VPS dedicated IP address as the A record, everything was done correctly! The remaining part is waiting for the DNS to fully propagate worldwide. To speed up the process, you may flush DNS and clear browser cache. Once the DNS is fully active, you will see a default loading page when visiting your domain via browser. Pointing a domain to VPS via custom nameservers is a bit trickier, as you will need to set up a new DNS zone on the virtual server. This method will switch the location of your DNS zone to the VPS, which means that all future DNS-related changes will have to be made through the newly created zone. 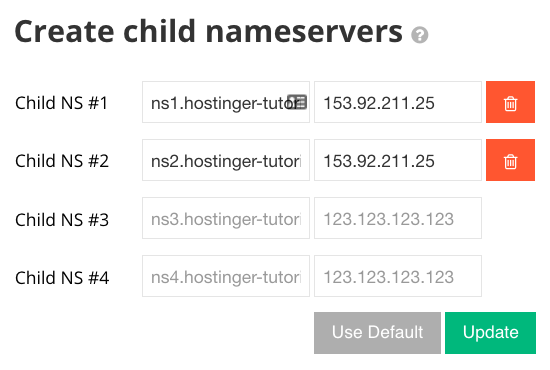 Start by creating new child nameservers for your domain. Each entry needs to point to the VPS dedicated IP address. 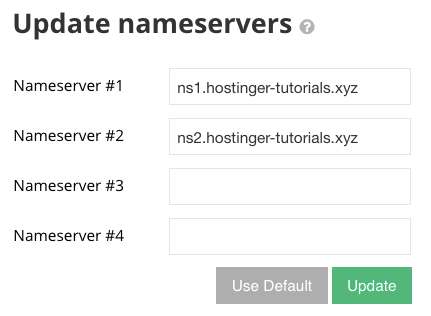 On Hostinger, you may easily do it using the domain management panel. 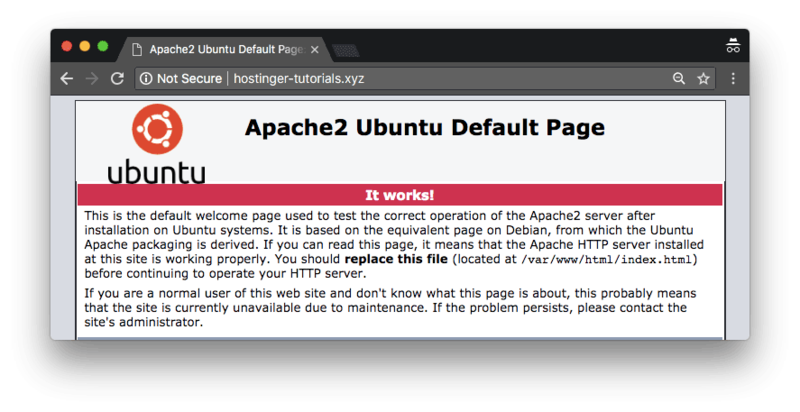 hostinger-tutorials.xyz. IN      MX      10      hostinger-tutorials.xyz. Since all pieces of the puzzle have been gathered, the last step is changing the nameservers of your domain to the newly created ones. On Hostinger, you may do it through the domain management panel. Keep in mind that DNS propagation may take up to 24 hours, thus you’ll have to wait at least an hour or two before everything is fully operational. To speed things up, you may flush DNS and clear browser cache. You may also use online DNS checkup tools to confirm the functionality of your newly created zone. Once the DNS finishes propagating, you will see a default loading page while accessing your domain through the browser. In some cases, you may be required to set up a reverse DNS record. Hostinger simplifies this process with an inbuilt tool at the bottom of your server management panel. Once added, keep in mind that it can take a few hours to propagate before the record is fully active. In this tutorial, we’ve learned two different methods of pointing a domain name to a virtual private server. It’s also important to remember that DNS changes can take at least a few hours to propagate worldwide. Once the domain starts working with your VPS, the real journey begins. A good place to start is creating a virtual host and installing LAMP. In case you have any questions, suggestions, or cool tips, make sure to share them in the comments below!